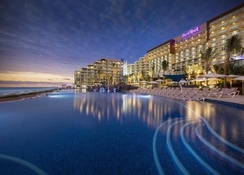 Step into Hard Rock Hotel Cancun, an all-inclusive 5-star resort situated on a beautiful beachfront mirroring true Mexican hospitality and cosmopolitan pizazz. With style that knows no restrictions, the hotel has taken all the amazing Rock n' Roll influence and made it an experience that should be lived. The all-inclusive guests gain access to amazing restaurants, delis, endless cocktails and in-room drinks from a liquor dispenser, incredible excitement and the best amenities. Situated in Cancun's Hotel Zone the hotel offers top line accommodation, furnished with a double hot tub and private balconies. This property is four minutes’ stroll from the shoreline. Guests can enjoy casual dining, delicious beverages & snacks, 24x7 in-room service, limitless world-class golf, land sports, wellness treatments, pool & beachside benefits, free Wi-Fi and free calls to the U.S. & Canada and lively amusement shows. 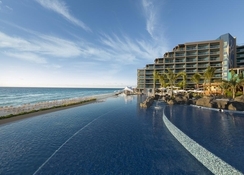 The hotel is located on a gorgeous beach in sunny Riviera Maya. Shoppers may engage in retail therapy at La Isla Shopping Mall which is just 2.5km from the hotel. Those interested in history and culture will find the Mayan Museum 2km away or the historical El Rey Mayan ruins at 4.5km. Cancún International Airport is about 17.5km from the property. The air-conditioned rooms and suites at Hard Rock Hotel Cancun offer absolute indulgence with a hydro spa tub, plush bathrobes, slippers, toiletries, hair dryer, flat screen satellite LCD TVs, fine linens, cotton duvet, coffee maker, mini-bar, safe, iron and board, in-room wine and liquor dispenser dispensing fine spirits. The rooms come in categories of Rock Star Suite (two-bedroom), Rock Suite Platinum (two-bedroom) with personal assistant, Deluxe Family (two-bedroom), Rock Royalty Level ─ Deluxe Platinum, Deluxe Diamond, Deluxe Platinum, Deluxe Gold – Pure and Deluxe Room, some rooms feature amazing sea views. 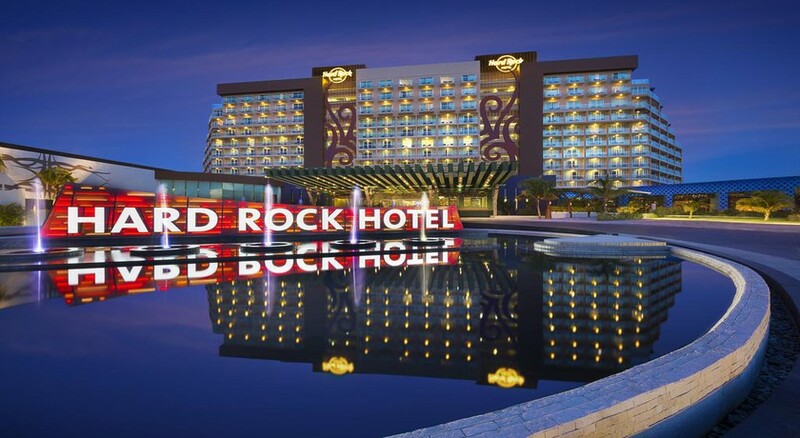 Hard Rock Hotel Cancun features five gourmet restaurants catering to guests’ palates with distinct flavours from near and far. Zen is for Asian, Ciao is for Italian and a sumptuous international buffet breakfast, Ipenama is authentic Brazilian steakhouse, the Market for international haute, Frida for Mexican and Pizetto is for pizzas and Mediterranean cuisine. There are several bar scattered around the property to serve you delicious drinks. 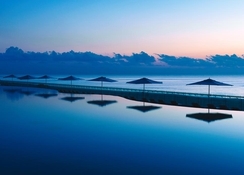 Visitors can relax at a sprawling open-air pool by the sea, two tennis courts and a full-benefit spa. With a Children & Young Adults Club, live daily entertainment and excursions to nearby attractions, guests of any age can have a memorable stay at the Hard Rock Hotel Cancun. There are many day trips to Chichen Itza, and Ek-Balam that guests can visit. The neighbourhood is full of cafés, restaurants and shops. 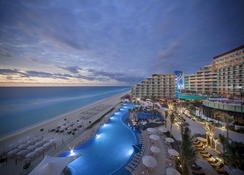 Hard Rock Hotel Cancun, this 5-star all inclusive resort is set on a beautiful beachfront and mirrors the best of Mexican hospitality and cosmopolitan pizazz. With style that knows no restrictions, this unique hotel is sure to make guests feel like they've stepped into an all-star film set. All inclusive guests at Hard Rock Hotel Cancun have access to a host of exciting facilities and amenities beyond the gorgeous stretch of beach it possesses, including a selection of pools and swim-up bars, the luxurious Rock Spa, an extensive Body Rock fitness centre, in-house beauty salon, Kids' Clubs, Golf Club, a fun-loving music lab and bundles more. The dining and nightlife scene are equally impressive, with an array of celebrity-style restaurants and delis available, plus seven bars and lounges to unwind in. After a full day soaking up the sunshine, relax at the hotel's plush rooms and suites, complete with ocean views, private balconies and even a hydro spa tub to ensure the comfort of guests. 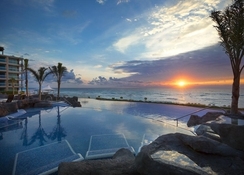 The hotel is located on a gorgeous beach in sunny Riviera Maya. Shoppers may engage in retail therapy at La Isla Shopping Mall which is just 2.4km from the hotel. Those interested in history and culture will find the Mayan Museum 1.8km away or the historical El Rey Mayan ruins at 3.3km. Cancún International Airport is 12.2km from the property. 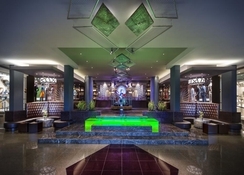 Hard Rock Hotel Cancun features six gourmet restaurants and delis catering to a variety of tastes. Zen, Caio, Ipanema, The Market, Frida and Pizzetto offer a selection of different flavours and cuisines, from Asian and Italian to Brazilian and Mexican. If guests prefer, in-room dining is also an option at the Hard Rock Hotel Cancun thanks to the 24-Hour room service available. The hotel's seven bars and lounges are equally as indulgent, with handcrafted cocktails, live music and entertainment on offer day and night. Visitors can relax at the inviting open-air pool overlooking the Caribbean sea, discover the two tennis courts, or unwind and feel the benefits of the spa. With a Children and Young Adults Club, live daily entertainment and excursions to nearby attractions, guests of any age can have a memorable stay at the Hard Rock Hotel Cancun. There are many day trips to Chichen Itza, and Ek-Balam that guests can visit. The neighbourhood is full of cafes, restaurants and shops. Due to renovation works in some restaurants, all regular servies will be provided in temporary locations according to the schedule given below. Will move to the Breeze terrace, service will continue from 11:00 AM to 6:00 PM.